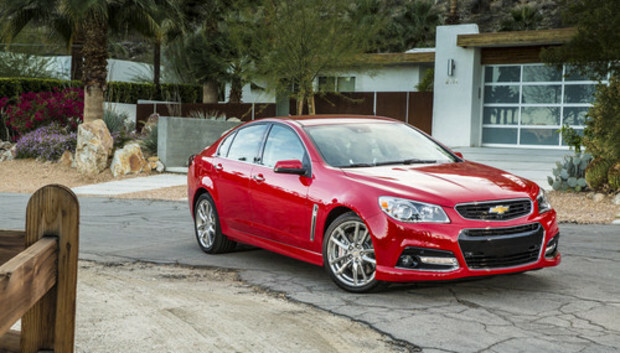 The 2014 Chevy SS may seem to be all about driving (given its powerful V8 415-horsepower engine), but it's just as much about parking--perpendicular parking. Many cars can parallel-park automatically, but the SS can also slide into a spot in a crowded parking lot almost all by itself. As long as you tap the brakes at the right time and let the SS do the steering, it works like a champ. The process is straightforward enough. First, press a button near the shifter to enable auto park. The display above the steering wheel will show a parallel-parking graphic, so you have to press and hold for a few seconds until you see perpendicular parking (think driving backwards into a mall parking spot, or into your own driveway). Then, you drive slowly around the lot and look for an open spot. You have to drive fairly close to the other cars. The SS will beep when it finds and opening, and you have to brake quickly to engage the system. You slide into reverse, resting your foot on the brake pedal, then let the car control the steering and backing up. In most cases, you'll have to go in reverse, shift to drive, let the car adjust the steering and go forward a bit, then ease into the spot. After several attempts, there was only one time when the SS put me a little too close to an RV. In another case, it tried to back into a stall already occupied by a motorcycle. I'm a big fan of automatic parking. The SS is able to scan the surroundings using sensors, and it will beep if someone passes behind the car. Few of us can be so vigilant. As long as you take it slowly, the SS can put you in the center of a spot most of the time. Chevy's joining a small club. At CES 2013, Audi demonstrated automated parking in a garage where the car actually goes and finds a spot on its own, while you walk off to work or play. Ford recently announced a perpendicular parking system where you stand outside of the vehicle and press a button to self-park. While self-driving cars get a lot more press, self-parking cars are already here and will make many nervous drivers a little happier to head to the mall.